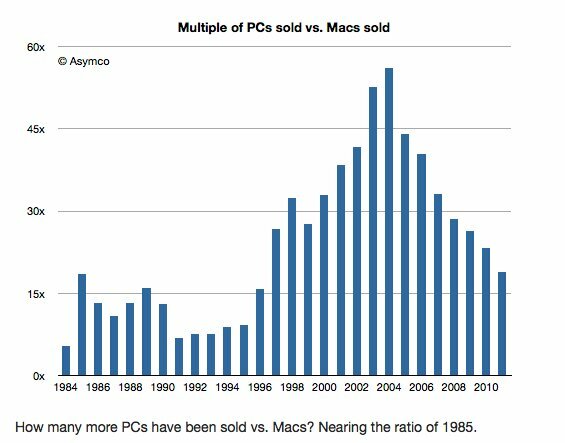 Asymco analyst Horace Dediu shows off a chart that illustrates the multiple of PCs to Macs sold each year since the early 1980s. The chart reveals that Apple's computing platform has been steadily gaining ground since 2003, and is now at levels unseen in over 15 years. This chart shows that the ratio has fallen back to level not seen since the mid-90s. A very important note, is that this chart only shows PCs vs. Macs, actual full-fledged computers that Apple doesn't really sell that much of. Another fact is that if the chart included iPhones and iPads, which given the constantly blurred lines of "what is a PC", the chart would be much more interesting.